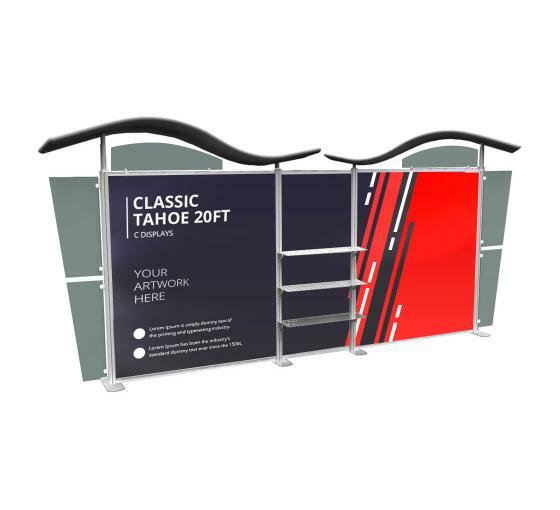 The Tahoe Modular Display System is available in a number of configurations making it the perfect back wall display for exhibition booths. The configuration of Classic Tahoe C utilizes a modular booth display design, making it easy to set up. The system's versatility also makes it fully customizable. Big panel (left & right): 79.75" x 79.75"
Small panel (center): 36.2" x 79.75"
Display Dimension: 238.3" x 96"
Box2: 52" x 33" x 13"